Triglav National Park is located between Italy and Austria and in the north-western part of Slovenia. It is the only national park in Slovenia; therefore it has great value for Slovenian people in their wish to preserve all the natural wonders in the park. 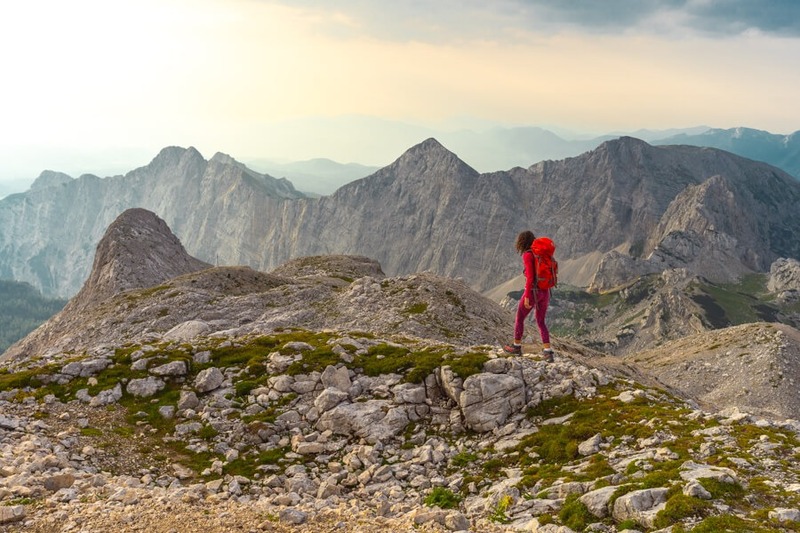 Also, it is one of the oldest national parks in Europe, because the legal protection dates back to 1924, when the Triglav National Park was established. Legal means and public institution protect the park since that year and their basic mission is the protection of nature, as well as carrying out research and professional tasks. Triglav National Park was named after Mount Triglav, the highest mountain in Slovenia. In contrast, the lowest surface area in the national park is in the Tolmin Gorges, which represent the most beautiful entry point to the area. The area of the park is quite big, because it covers four percent of the surface of Slovenia and that is exactly 880 square kilometers. The Triglav National Park in Slovenia offers a unique experience, because of an exceptional natural beauty and cultural heritage. There are so many things to do and see that visitors may have a tough time to select some of their favourite places. In this article we will try presenting several places that are best for hiking, sightseeing and exploring. In case you have some special desires and wishes about tours, sport activities or any other information, please feel free to contact our team members and they will give more detailed information. Mount Triglav is situated in the heart of the Triglav National Park and is part of the Julian Alps. Mt. Triglav is 2864 meters high and with this height is the highest mountain in the territory of Slovenia. At the top is the Aljaž tower, which was constructed in 1895 by Jakob Aljaž, catholic priest from nearby village Dovje. Today, the Aljaž tower is protected as a cultural monument and as such, vital in preserving the cultural heritage. From the top of Mt. 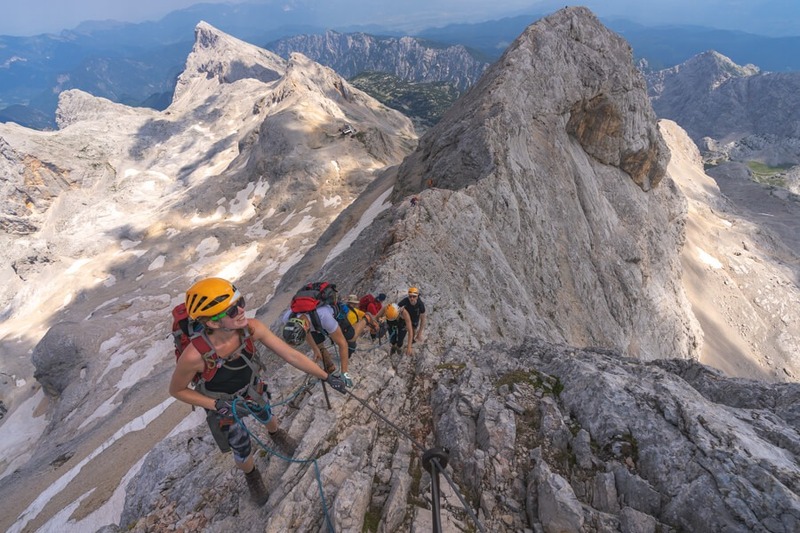 Triglav, a spectacular view opens from the Adriatic Sea, through the Dolomites and high peaks to the Karavanke and to the Kamniško Savinjske Alps and lastly to plateau Pohorje. Many hikers visit and climb Mt. Triglav in the summer and autumn and there are many different tours available how to get to the top. Most hikers select their tours based on their knowledge of the trails and their physical capacities. Most popular tour to the top of Mt. Triglav begins and ends in a beautiful Alpine valley called Vrata. However, there are many other hiking tours to the top of Mt. Triglav. Tours to Mt. Triglav can start from valleys Kot, Krma and Trenta, but also from the village Bohinj and plateau Pokljuka. The tour from the Krma valley is most common and hiking friendly route and the tour from Vrata valley is the shortest route. In spite of everything, Mount Triglav is a national symbol and brings together all Slovenian people. Book your tour with our experienced guides and see for yourself why this highest mountain is so unique. The valley of the Triglav’s lakes is the Alpine valley located between Bohinj and Trenta. The valley of seven lakes is eight kilometres long and is considered as one of the most beautiful parts of the Julian Alps. The area was officially protected in 1924 as the Alpine Conservation Park, but later in 1961 Triglav’s seven lakes were protected under the state institution of the Triglav National Park in Slovenia. Therefore, all seven lakes are located in the heart of the Triglav National Park. In fact, there are ten lakes in this valley, but the name of seven lakes was nevertheless kept for several reasons. First, because of the magic of the highlands in the Julian Alps, especially in the winter time and as a result number seven was taken as a fairy-tale number. Secondly, there are three out of ten lakes that are left without water in the warmer months of the year, but remaining seven lakes are filled with water all year round. 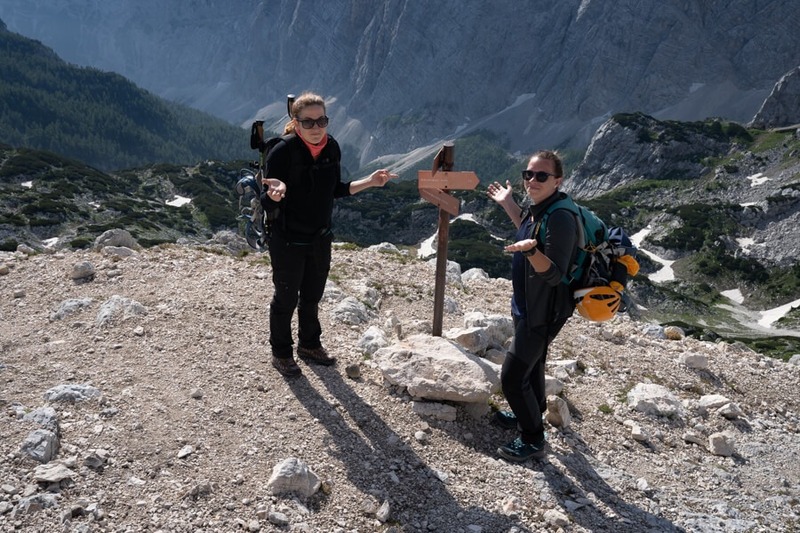 Hiking across the Triglav National Park in Slovenia represents an excellent experience for all hikers and nature lovers. Valley of seven lakes is also very beautiful for hiking in the winter time where lakes really stand out with their fascinating colours. In the summer, we can see many interesting and unique vegetation in this area. During a tour we might see a family of wild goats named Alpine ibex that live at the highest peaks of the Alps. These mountain animals have incredible skills and abilities in climbing the steep slopes and mountain cliffs. If you would like to get a spectacular view like these mountain goats have, then sign up for an adventurous experience in climbing on the steepest slopes of the highest mountains. 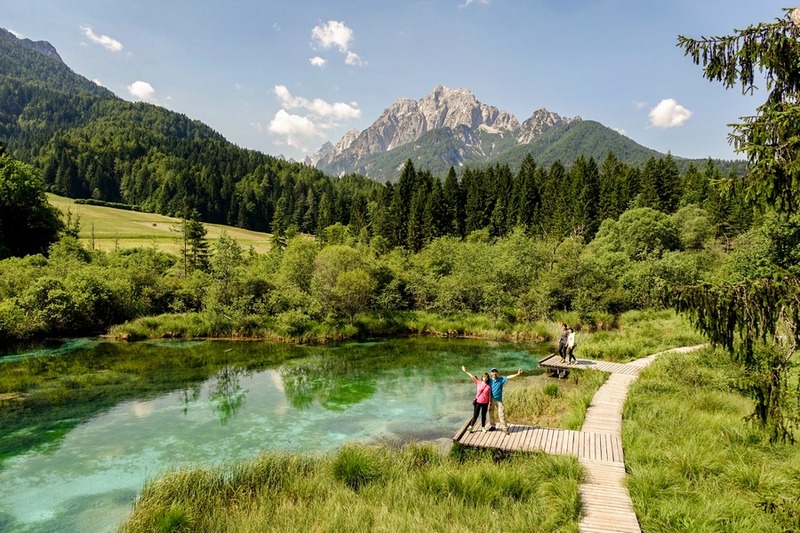 Otherwise, the area in the Julian Alps offers many different tours that excite hikers, but the valley of the seven lakes is something special. With each step, we move further along the length and as well as altitude and discover all the seven lakes one by one. First, we see the Črno Lake, which is the warmest among all lakes and is located in the middle of the forest. Then we move towards the Dvojno Lake and on the way up we see a Veliko Lake, which is the largest and deepest lake among all the lakes. After Big Lake we reach the Zeleno Lake, famous for its beautiful green colour. If you are interested in a hiking tour along this magnificent valley of seven lakes, you can sign up here. 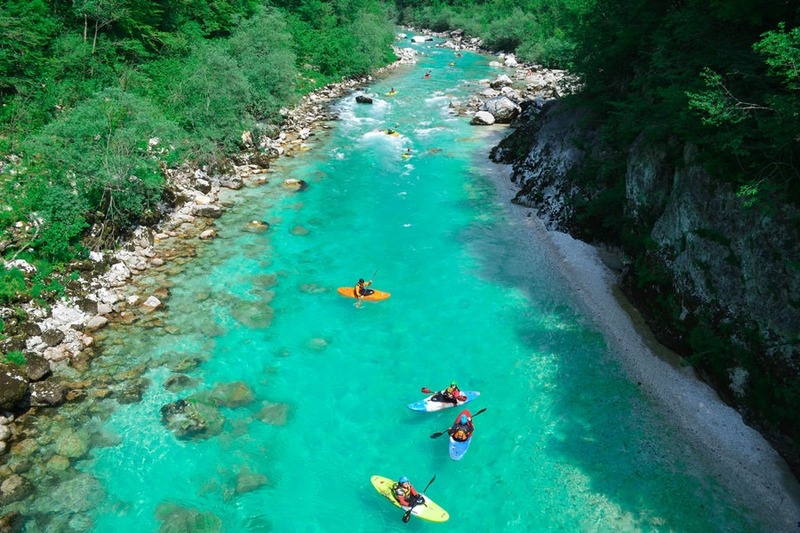 For many, the Soča River in Slovenia is one of the most beautiful European rivers. Because of its natural beauty, preservation and historical circumstances, the Soča River contains special significance and value in the hearts of the Slovenian people. The valley of the Soča River and the surrounding mountains are also known for its history. Between 1915 and 1917 there were battles of the Isonzo, where more than 300 thousand Italian and Austro-Hungarian soldiers lost their lives. The emerald flow of the Soča River is lively, flowing over rocks and carves its 136 kilometers way towards the Adriatic Sea, creating numerous lagoons and embankments in its delta. Soča River originates in Trenta Valley, in the heart of Triglav National Park. Soča River keeps torrential stream on its way, repeatedly forced to squeeze into tight gorges and canyons. Soča River in Slovenia is known for its deep and narrow gorges, carved into the lively valley bottom. Due to the withdrawal of the glaciers, the river has carved in the outgoing valley floor and produced a narrow ten meters deep gorge. These natural features of the river provide superior canyoning experience for all adventure fans. During the spring and confluence with Tolminka, the Soča River is unspoiled and as such declared as a natural monument in this region. Further down the village Solkan, the stream of the river is very lively and for that reason popular with kayak enthusiasts. See for yourself and book your kayaking adventure here. 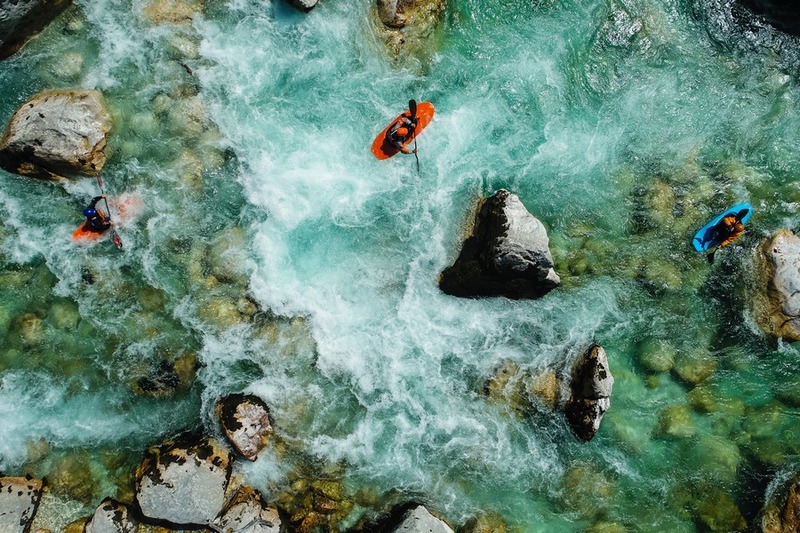 Soča River in Slovenia is a paradise for all sports enthusiasts. The upper stream valley of the river is ideal for kayaks, canoeists and rafters. Rafting and Hydrospeed journeys on the crystal-clear Soča River allow us to observe the wonderful surrounding nature and at the same time have fun at the adrenaline rapids. Also, the surrounding peaks of the nearby highlands are ideal for hiking and mountain biking. From the Soča valley there are numerous hiking tours to the surrounding high mountains like Triglav, Kanin, Krn and many others. From the spring of the Soča River there is twenty kilometers long hiking tour named after the river. Part of the hiking tour in the in the Soča valley can be walked on foot, even better with a bike. In the wintertime you can explore the beautiful and quiet Soča Valley on a fun way with snowshoeing. The Soča tour is one of the oldest natural hiking tours in the Triglav National Park and leads visitors from the source of the Soča River along the Trenta valley to the border of the park near Kršovec, where it ends on one of the hiking trails in Bovec. Most hikers and nature lovers, visit Triglav National Park in the summer. Yet, wintertime in this area offers the most magnificent experience, because it is surrounded by a snowy landscape where you can find a lot of peace and beautiful places. There is one particular tour that takes you to Bohinj Lake and then to Peričnik Waterfall in the Vrata valley. Peričnik Waterfall is the great keeper of the Vrata Valley, because it is one of the highest Slovenian waterfalls with its 52 meters. Cold days turn this waterfall into an icy kingdom and create wonderful ice candles. Then the tour takes you to Kranjska Gora, a famous Slovenian ski resort. After visiting ski resort, the road takes you to Zelenci Lake. Zelenci Lake is very attractive in the wintertime, when everything around the lake is snowy and white, but the lake is coloured in a beautiful emerald green colour. See the whole winter alpine wonders tour plan here. Ski touring is best when heavy snow falls in the nearby mountains and consequently creates finest ski powder. The ski slopes in ski resorts offer smooth trails, but the greatest pleasure is to ski on the tracks outside the ski slopes. Ski touring in the Triglav National Park is a great experience for all adventure enthusiasts who would like to explore stunning nature in the winter wonderland. Hiking in untouched nature also offers great pleasure, especially during the winter months when all vegetation and animals are resting. The most beautiful views are on the plateau of Pokljuka, where you can observe the surrounding mountains, especially the mountain Triglav, which is the highest among all. In spite of all the tranquillity in the wintertime, it is also necessary to have fun. You can rent sledge and go down from the surrounding hills of Lake Bled. Then again, if you are even more courageous, you can go to night sledding, which will give you a fun experience to remember.